Apologies for the lack of recent updates-the last four days has certainly seen the autumn come to life. Favourable easterly winds and rain on the 28th brought several new arrivals although slightly more had been hoped for and there wasn't much to offer on the 27th with 3 Sooty and 7 Manx Shearwaters the best a sea-watch could offer. 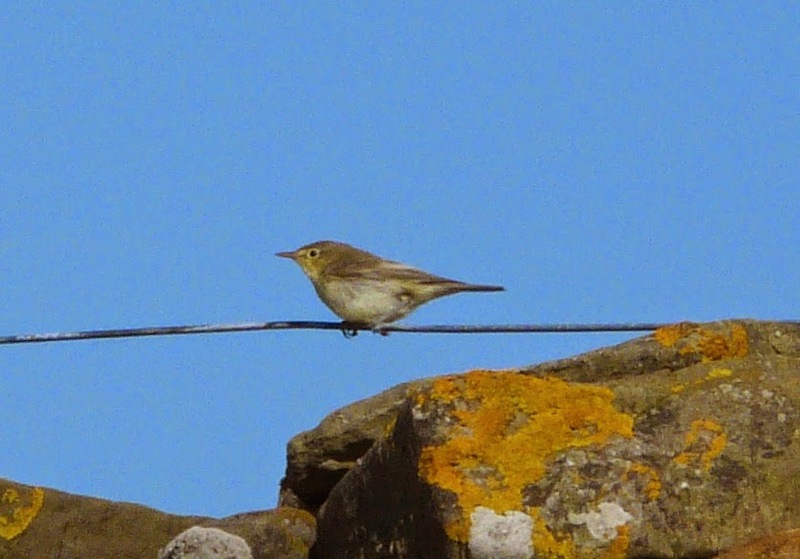 Half a dozen Willow Warblers were seen that day with the same number on 28th while new birds included a Wryneck and Tree Pipit at Holland House, a Common Tern off the south coast and 3 Common Rosefinches. Some wildfowl movement on 29th saw 124 Teal feature with 38 Wigeon and 2 Gadwall next day. Other birds in the roll call were 12 Ruff, 4 Greenshank, 6 Common Terns, 2 Swifts, single Redstart and Wood Warbler, 2 Pied Flycatchers, a juvenile Red-backed Shrike at Milldam and 4 Common Rosefinch. An especially calm 30th saw birds move into the gardens and favourable feeding areas but it was a juvenile Spotted Redshank on Gretchen early in the morning which was the highlight-the first island record since 2008! A Wood Sandpiper was also there and 24 Ruff and 2 Greenshank were seen. 3 Barred Warblers were new and commoner passerines increased to 15 Willow Warblers, 7 Garden Warblers, 3 Pied Flycatchers, the Wryneck, Red-backed Shrike (with possibly a second bird present) Wood Warbler and Redstart all remained and 3 Common Rosefinches lingered on at Holland. At least 2 Kestrels were also seen over both dates, as was a Sparrowhawk and there have been at least 3 different juvenile Hen Harriers in recent days. The 24th was more of the same with 2 Common Rosefinches the pick of what the light easterlies had to offer as well as 5 Willow Warblers. Elsewhere on the island it was migrant waders entertaining with a minimum of 1546 Golden Plovers, 14 Knot, 117 Sanderling, 19 Ruff and 34 Black-tailed Godwits. 7 Pochard arrived and a juvenile Peregrine was new, the Robin was trapped at Holland House and singles of Rock Pipit, White Wagtail and Sandwich Tern were seen. Continued seawatching attempts only frustrated with a single large shearwater sp. seen distantly, plus 8 Sooty Shearwaters, 26 Manx Shearwaters and two Common Terns also. 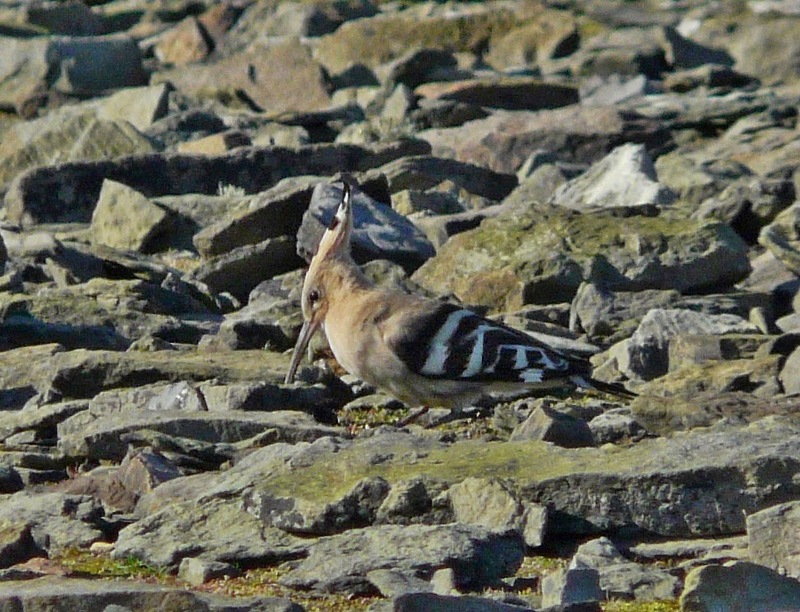 As suspected the previous day 3 Common Rosefinches were confirmed to be present but the highlight came in the evening when a Hoopoe was found feeding on the west side; just the sixth North Ronaldsay record and the first for over ten years. A quieter 26th began well with an Icterine Warbler trapped at Holland House the highlight, whilst a 2 Grey Herons and 5 Black-tailed Godwits flew south, 5 Whimbrel were in the fields, the first 2 juvenile Hen Harriers appeared on time and 3 more Sooty Sheawaters passed the North end. With calm sea's, light east winds and large Shearwaters in the North Sea seawatching dominated the first half of this period, the 21st the better day with 9 Sooty Shearwaters and 137 Manx shearwaters, a 'blue' Fulmar amongst 1369 typical Fulmars, 238 Gannets, 247 Kittiwakes and best of all a Pomarine Skua. 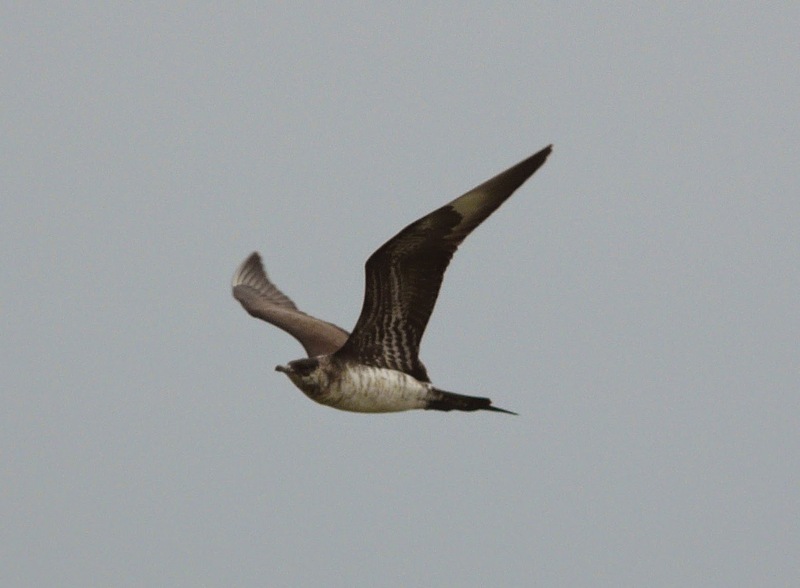 A second of the this species was reported later that day as well as a Great Shearwater. 9 Pochard arrived on 21st and Garden Warbler and Common Redpoll were new. Ruff totalled 37, singles of Greenshank and Common Tern were seen and the Red-necked Phalarope remained. An early Robin was at Holland on 22nd as were 2 each of Chiffchaff and Willow Warbler. Also present were 27 Black-tailed Godwits and a Green Sandpiper. 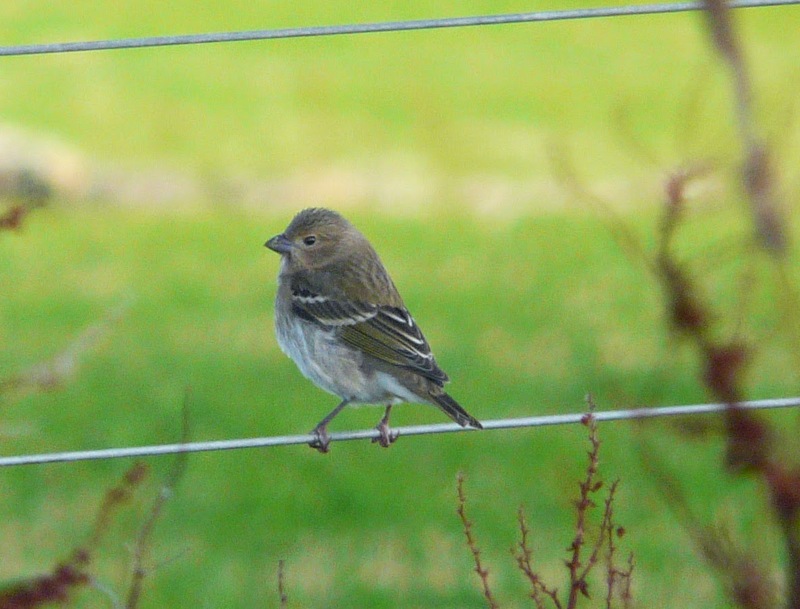 The 23rd held a little more excitement as September approaches with another/the Common Rosefinch near Kirbest and a Wood Warbler by Greenwall. A Tree Sparrow at the Bird Observatory was potentially that seen earlier in the week while its much commoner cousin the House Sparrow, reached a respectable figure of 225. Meadow Pipits continue to increase with152 today as do Wagtails with 2 White and 20 Alba's were logged and the first returning Red-throated Diver was noted. The north-westerly winds persist, but as expected the occasional interesting bird trickles in despite the blustery conditions. After a rather stationary 18th when a Swift was the only new bird the 19th was such a day with a juvenile Red-necked Phalarope the pick of the arrivals, joining the lingering adult on Gretchen Loch. Another Phalarope sp. was seen on a sea-watch (also thought likely to be Red-necked) but just too distant to identify, with other sightings from a 2 hour effort being 28 Manx and a single Sooty Shearwater, 8 Storm Petrel and 749 Fulmars-including the first dark morph of the year. A Common Rosefinch in Holland gardens was also the first of 2014 with a Sand Martin around the south end the only other passerine of note. Not much to report in difficult conditions on a wet and windy 16th-a couple each of Green Sandpipers and Sand Martins most notable. With the forecast rain failing to materialise on 17th it was more pleasant birding, but after a calm start the wind had increased to near gale force by afternoon. The Barred Warbler was still at Holland House in the morning, where a/the Tree Pipit flew over and there were also 2 each of Garden and Willow Warblers. A moulting, adult Red-necked Phalarope on Gretchen Loch from mid-morning proved entertaining and may have been the bird first seen a few days ago? 48 Black-tailed Godwits were split between two flocks and Ruff continue to be prominent with at least 49 today-although the actual total could easily be closer to 70! Familiar waders continued to feature as with the previous few days on the 13th but the undoubted highlight was a Red-necked Phalarope on Gretchen Loch briefly in the afternoon. The 14th was a smelly affair with a 9 hour 'Fulmarathon' to ring the chicks along the coast taking priority. A total of 120 were ringed (great experience for our 3 trainee ringers) and the first stranding of adults this year added 10 more to the day's tally. 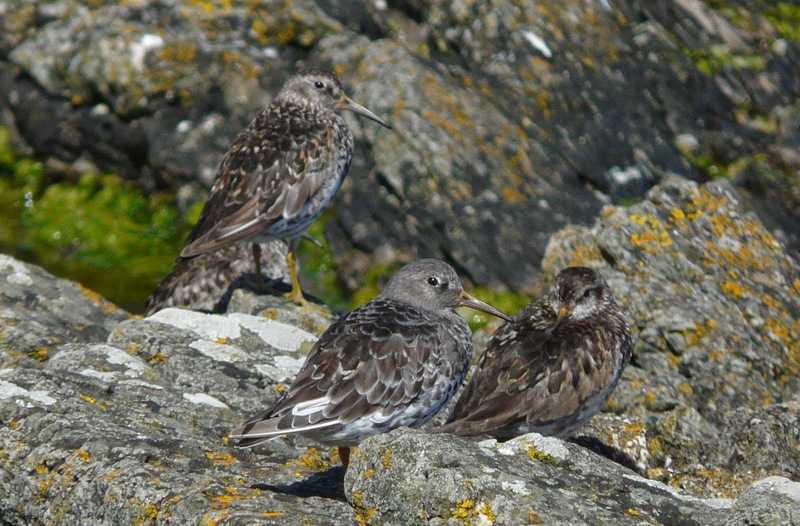 Casual sightings during the day included a Black Redstart, 2 Common Sandpipers and at least 17 Ruff. There was more to report from the 15th which began with 4 Sooty and 12 Manx Shearwaters on a mornings sea-watch. 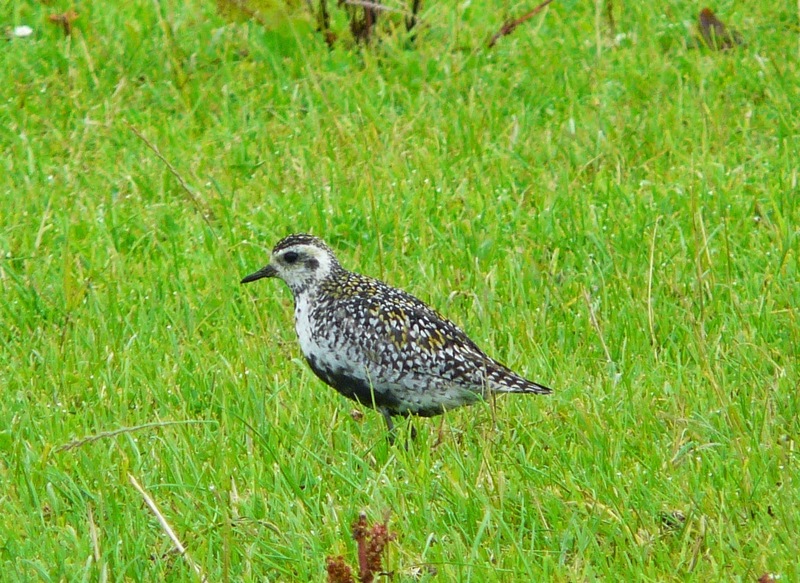 The Golden Plover flock increased again to a minimum of 1250 birds, and found among them mid-afternoon was a smart, adult American Golden Plover. Black-tailed Godwits increased to 32 and at least the same number of Ruff were present, along with 2 Greenshank, 2 Wood Sandpipers and 3 Common Sandpipers. A group of 6 Pochard were on Hooking and a few passerines were also seen with the same Barred Warbler as last week at Holland House again along with 3 Garden Warblers and a Tree Pipit. Its been a busy few days for the observatory, with half the team currently off the island at the Rutland Birdfair. 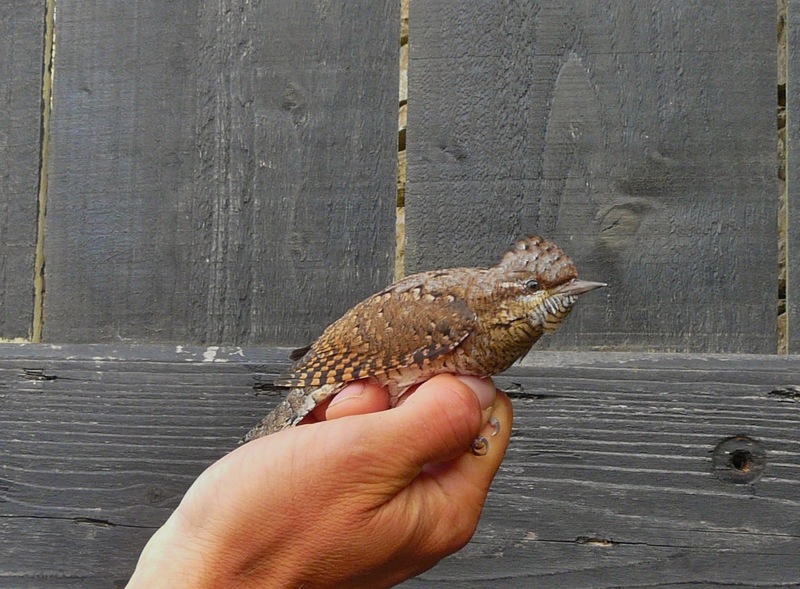 So if your there too-don't forget to visit the Bird Observatory Council stand in Marquee 2 (stand 17) to find out how you can win a week's stay for 2 at NRBO by supporting our work and becoming a 'friend'. 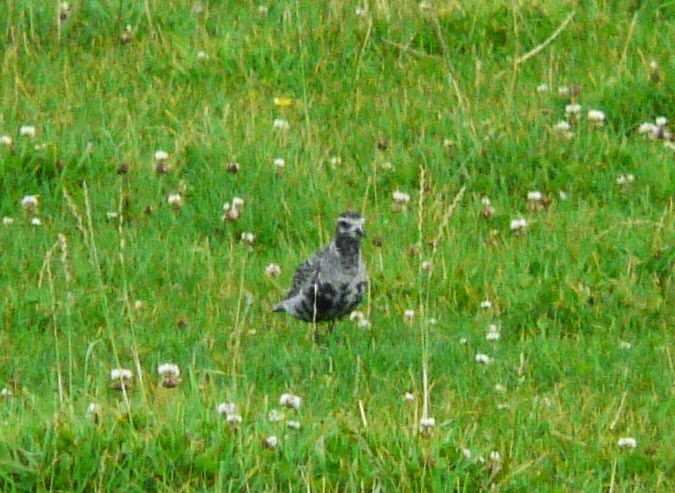 Record shot's of today's American Golden Plover-plumage features match those of a bird photographed on South Uist last week. This is the earliest autumn record for the island and it comes just as last month's Pacific might have moved on having been missing for a few days. 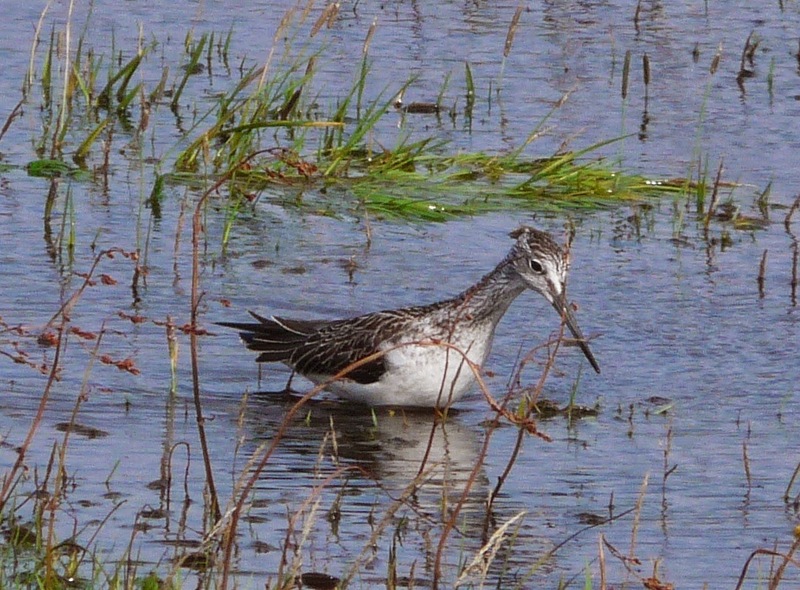 As expected, it's migrant waders continue to dominate the sightings. 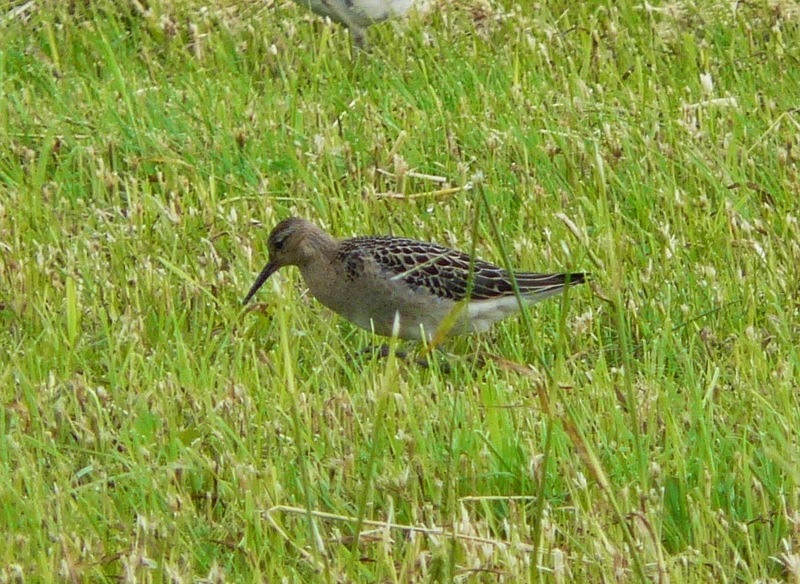 An impressive 35 Ruff (including a flock of 27! ), 7 Greenshanks and 11 Green Sandpipers were recorded on 11th with the respective totals for the 3 species dropping to 21, 4 and 1 the following day. A group of 17 Black-tailed Godwits also pitched in that day while the adult Pacific Golden Plover was noted again on the former date. 3 Pochards were new, and though passerines have been in short supply (up to 2 Garden and 4 Willow Warblers) a Whinchat in the Observatory crops was widely appreciated having been the spring's 'bogey bird'. The autumn sprung into life in dramatic fashion, but we had to endure what must have been one of the heaviest days rain in the islands history on the 9th to get it! From dawn till dusk, torrential downpours battered the island forcing moving waders to drop in in impressive numbers with immediate effect. Birding was virtually impossible, but several pairs of waterlogged binoculars did manage to record a minimum of 14 Greenshanks (equal record count), 11 Green Sandpipers (record island count)and 13 Ruffs. The Pacific Golden Plover was seen at Holm, a Pied Flycatcher at Sangar and 3 Willow Warblers were noted on a soggy walk around the north end in the evening. With the rain clearing away on 10th, birding was a much more pleasant experience and plenty of birds were still around to see. 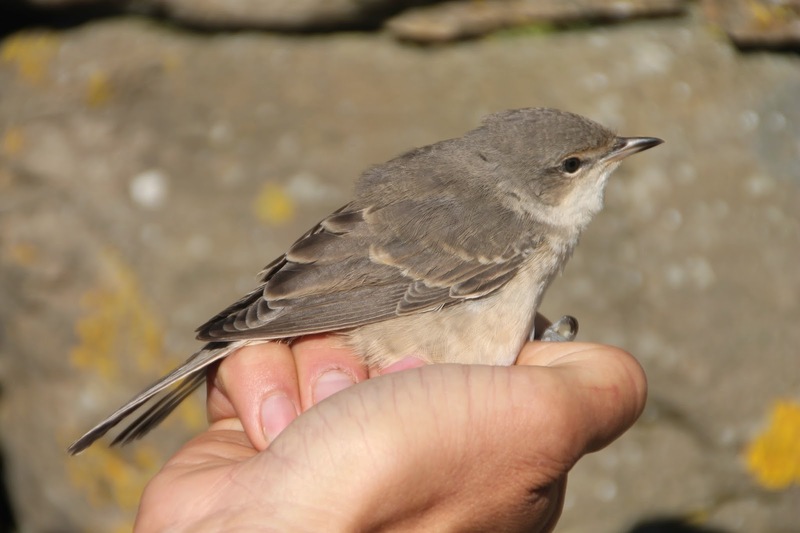 A Barred Warbler caught and ringed at Holland gardens was followed by another at Antabrek a few hours later, with 3 Willow Warblers scattered about and a Black Redstart at Nouster. The Green Sandpiper record was broken again with 13 birds now present, along with 8 Common Sandpipers, 10 Greenshank and 14 Ruff while the first Peregrine for almost 3 months flew over the observatory, and a Common Tern was among the Arctic Tern flock at the south end. After a blast of easterly winds and some overnight rain a few migrant passerines were expected on the 7th, and exactly 4 Warblers were recorded! 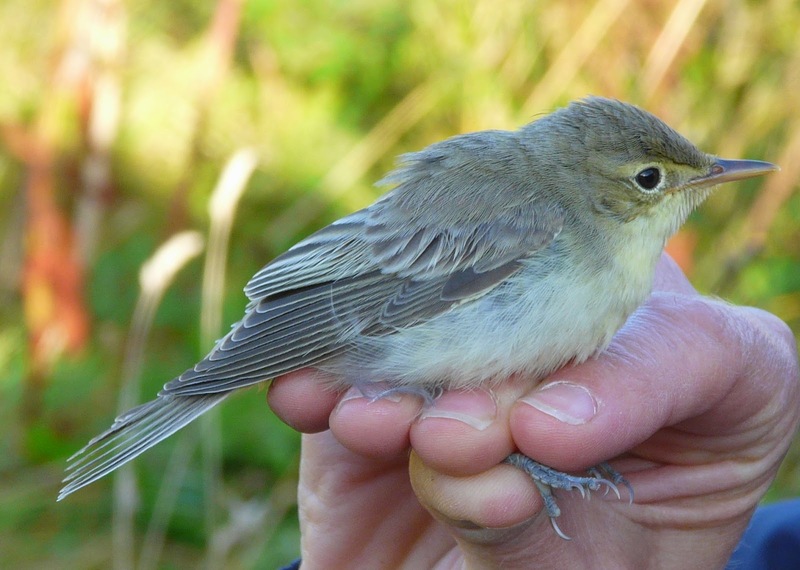 A couple of Garden Warblers were in Holland Gardens and the first Willow Warbler of the autumn shared a dyke at Nether Linnay with the first Icterine Warbler of the year-after a rare, blank spring for the species. After lunch a Honey Buzzard was picked up over Ancum Loch, and presumably having landed somewhere on the west coast was seen heading south over the observatory almost an hour later. The Pacific Golden Plover was seen on both days, with other wader highlights being a Common and 2 Green Sandpipers on 7th with a single of the latter and 6 Ruffs on 8th when a Kestrel was also seen. Present on all dates were a single Heron, the Pacific Golden Plover and 2 Swifts on 4th reduced to singles on 5th and 6th whilst Ruffs reversed the trend increasing from 1 to 6. 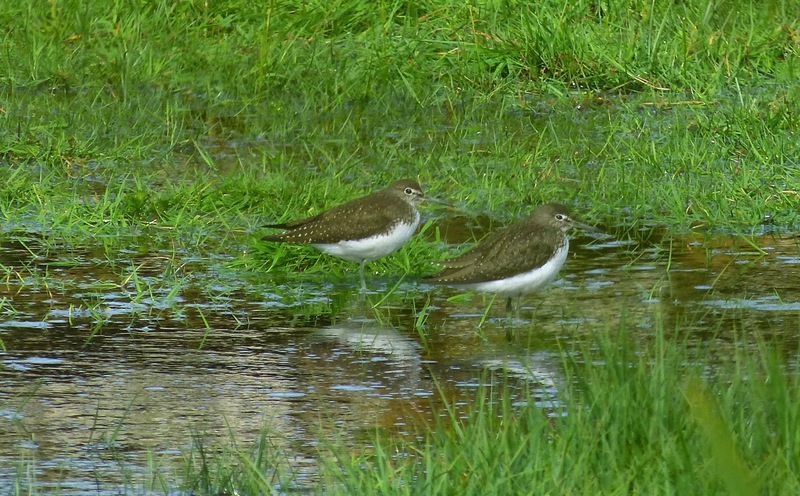 Two Green Sandpipers were seen on 5th and a Common Sandpiper, 5 Black-tailed Godwits, 120 Dunlins and a Garden Warbler at Scots Ha on 6th is hopefully the start of Autumn migration. A Pink-footed Goose at Hooking was most likely the lingering late Spring bird. Returning adult waders continue to trickle in whilst the first migrants appear, including Black Redstart and a couple of Sedge Warblers, the latest trapped at the Bird Obsevatory The Pacific Golden Plover remains and seawatching has started brilliantly with the first Sooty Shearwater and 87 Manx Shearwaters on 2nd followed today by a record breaking 291 Manx Shearwaters in just two hours before fog halted proceedings. Also seen were 4 Sooty Shearwaters, 426 Fulmars and 437 Puffins. Later in the afternoon 4 Greenshanks were seen flying over Ancum. All notable sightings on 30th but for a Collared Dove were typically waders with the Pacific Golden Plover still, 4 Knot, 2 Black-tailed Godwits, 6 Whimbrel and 107 Turnstone. 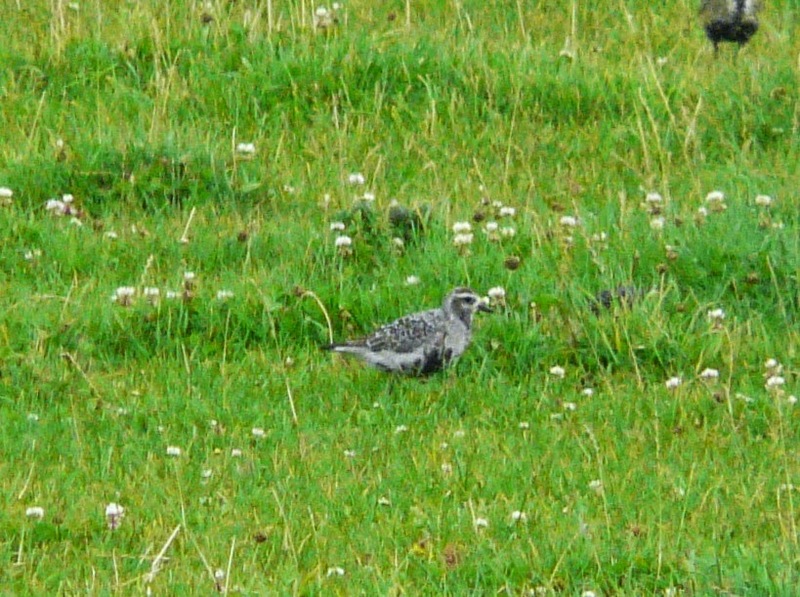 The 31st saw the first Rock Pipit over and a Ruff was by Holm.